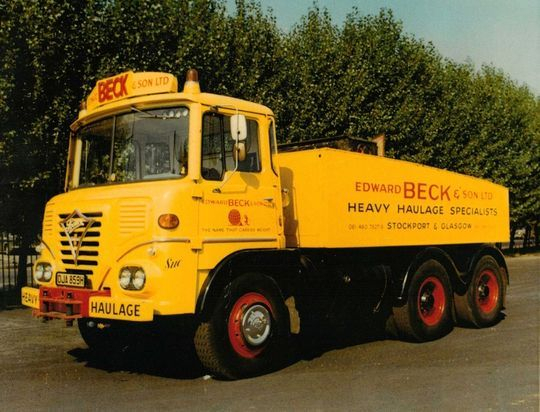 From the early days in 1953 when Edward Beck formed the company of Contractors (Transport) Ltd the heavy haulage fleet always consisted of a variety of Sandbach built Foden vehicles. In this section you can see just a few of the many Foden built vehicles the company operated from the FG Foden's of the early 1950's through to the Foden S40 of the 1970's. 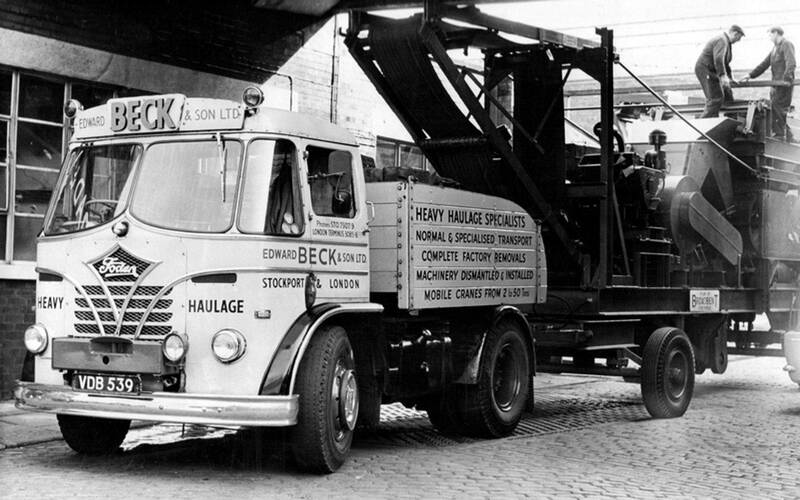 With an unladen weight of 14 tons and a top speed of 12 m.p.h this 1950 registered ex Pickford's FG Foden 6x4 ballast tractor, Reg No HGB 631, is seen here hauling one of the many purpose built trailers that Edward Beck built in house at their own extensive workshops in Stockport. With a large steel tank on board it is negotiating a right turn at the junction of Liverpool Road, Deansgate and Great Bridgewater Street in the centre of Manchester in 1955. To see this exact location today HERE. 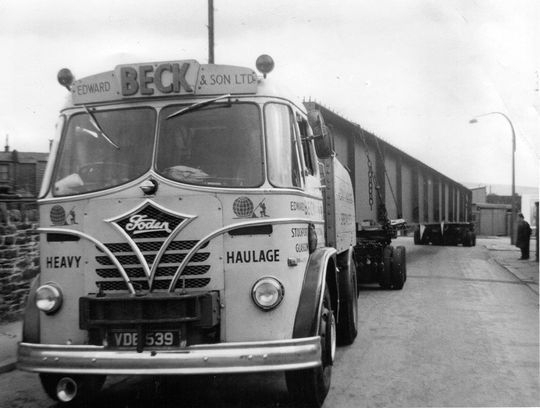 FG Foden ballast tractor Reg No KDB 703 is pictured here when brand new in 1955. 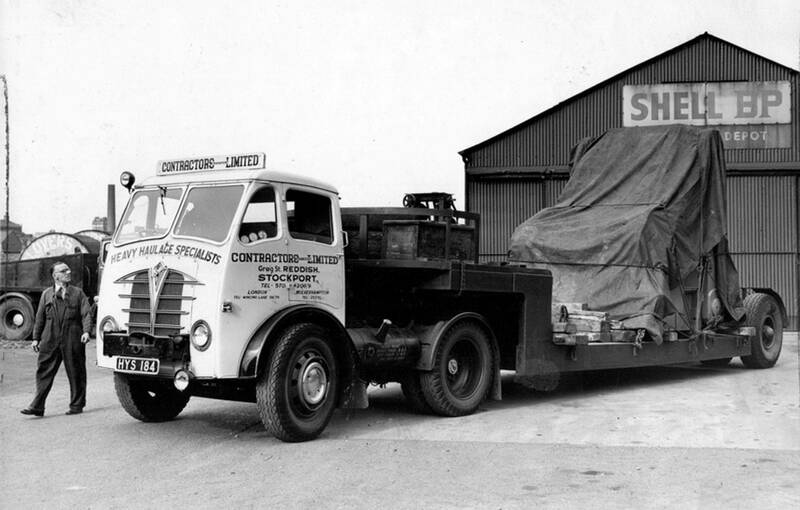 It is being driven by Len Etherington who has just collected the vehicle from the Foden factory at Sandbach. 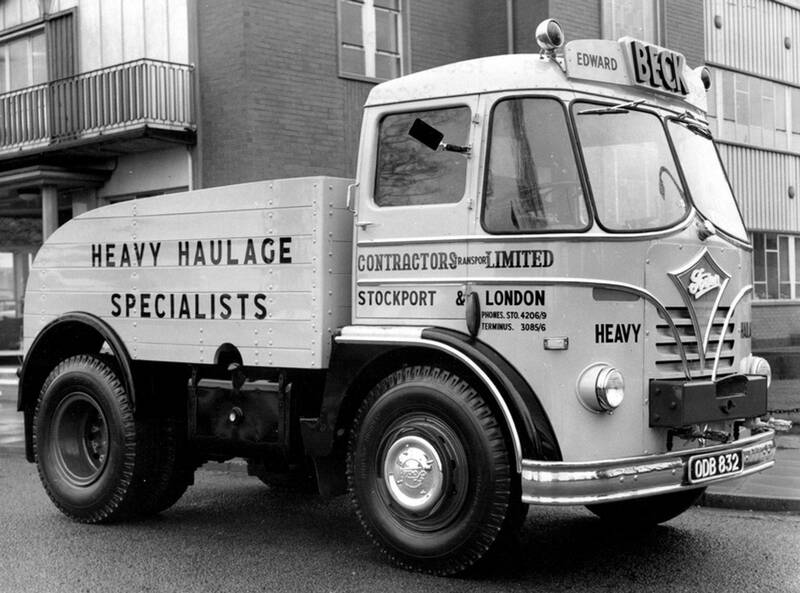 In those days Foden vehicles would supply a complete vehicle with a coach built cab fully painted and lettered ready for the road. A rear view of FG Foden ballast tractor Reg No KDB 703 running on trade plates when brand new in 1955. 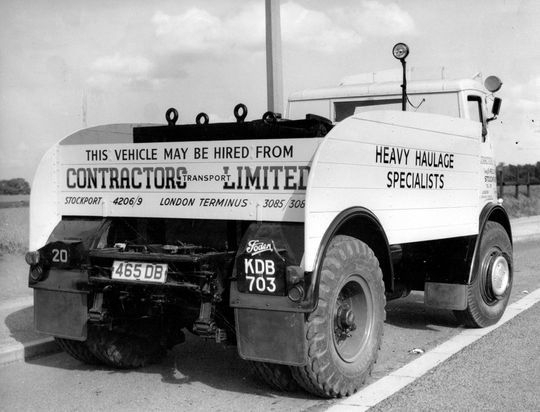 The ballast box was detachable allowing the vehicle to be also utilised as a tractor unit. FG Foden 4x2 ballast tractor Reg No KDB 703 is pictured here in 1955 on it's first job when brand new in the livery of Contractors (Transport) Ltd, which was one of Edward Beck's originally owned companies. 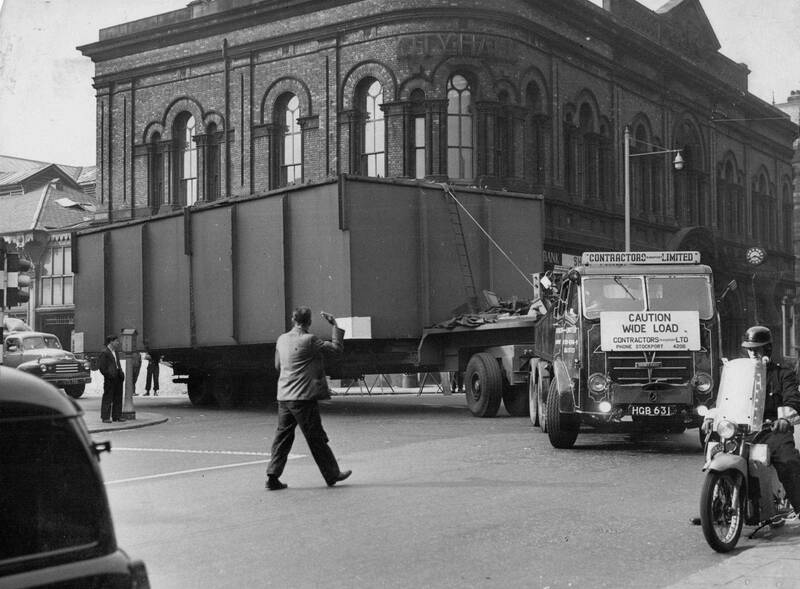 The photograph was taken outside the premises of John Shaw & Sons (Salford ) Ltd.
Another shot of 1955 registered FG Foden 4x2 ballast tractor Reg No KDB 703 seen here on the B6266 Entwisle Road in Rochdale. 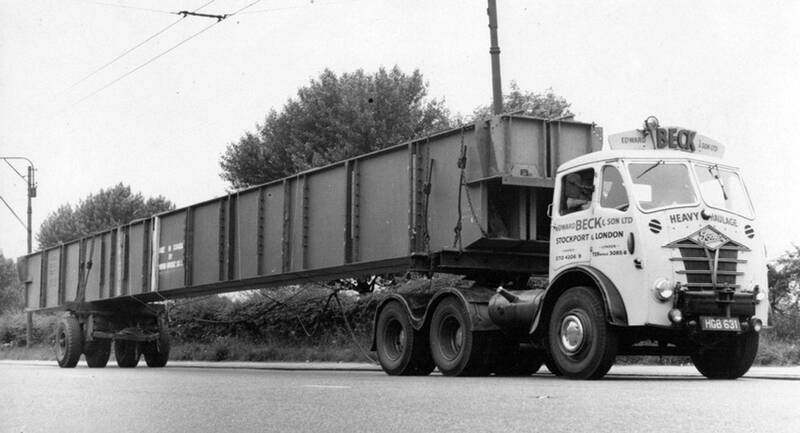 Driven by Brian Daniels it was being used at the time with its ballast box detached and running solo as a back up tractor unit should any problems arise during delivery of steel bridge beams to the M62 Motorway construction site at Rakewood Viaduct near Rochdale. To view this image full size click on picture. 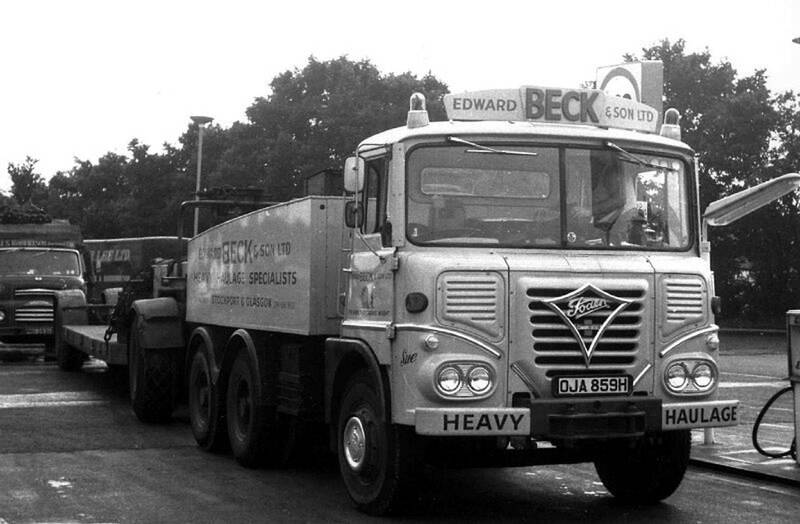 The first of several shots of Edward Beck's FG Foden 4x2 tractor unit Reg No HYS 184. 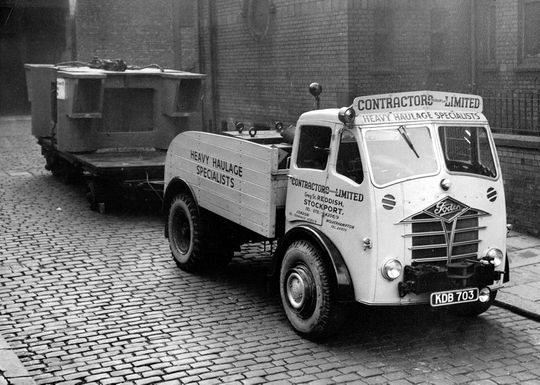 This vehicle ran in the livery of 'Contractors (Transport) Ltd' which was one of Edward Beck's originally owned companies that concentrated on heavy haulage. 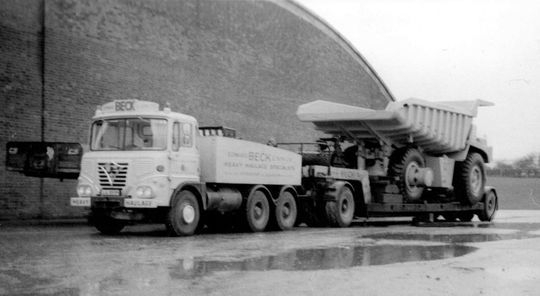 Originally registered new to Pickfords Glasgow on the 20th of November 1950 it is seen here when six years old in 1956 at Beck's Higher Bury Street depot in Stockport coupled up to a low-loader with a sheeted load on board containing a Shaw McNeil steel moulding press. Another shot of FG Foden 4x2 tractor unit Reg No HYS 184 in 'Contractors (Transport) Ltd' livery. Originally registered new to Pickfords Glasgow on the 20th of November 1950 it is pictured here coupled up to a one of the company's heavy duty tank transporter trailer's. FG Foden 4x2 tractor unit Reg No HYS 184 is pictured here again this time at the junction of Higher Bury Street and Georges Road in Stockport. 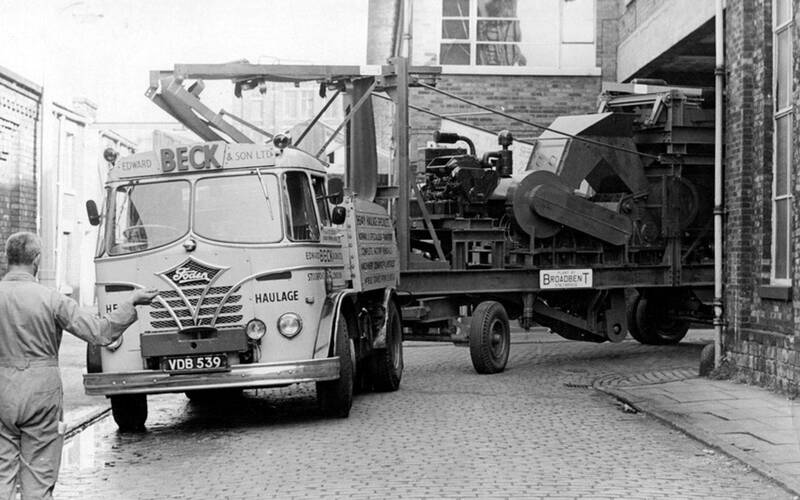 It is about to set off with a sheeted load containing a Shaw McNeil steel moulding press. FG Foden 4X2 tractor unit Reg No HYS 184 is pictured here again this time while loading up at the premises of Heat Exchangers Ltd Trafford Park Manchester. The large heat exchanger was destined for the North Thames Gas Board at Kensal Green London. Taking time out for a photograph FG Foden 4X2 tractor unit Reg No HYS 184 is seen here while working for The General Engineering Company Ltd of Radcliffe near Bury Lancashire. The driver of HYS 184 at the time was Stan Driver, who is pictured standing on the left. 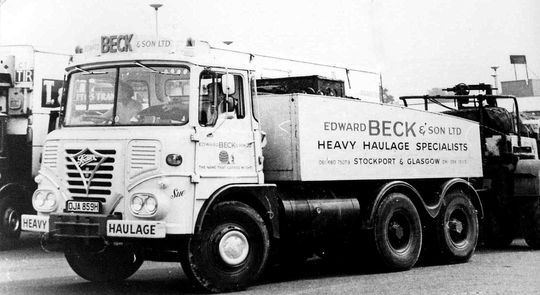 The final shot of FG Foden 4X2 tractor unit Reg No HYS 184 show's it after being given it's Edward Beck & Son Ltd livery in 1959. 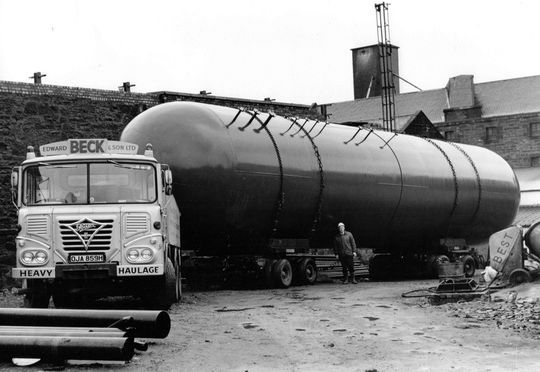 The sections of steel storage tanks were manufactured by Daniel Adamson and Co of Dewsnap Lane Dukinfield. 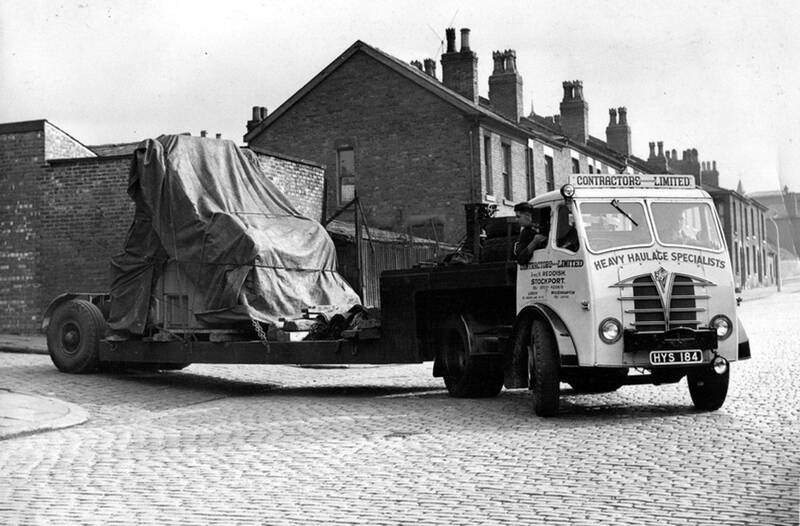 The rear load is being hauled by Scammell Highwayman 4X2 tractor unit Reg No GLD 659. 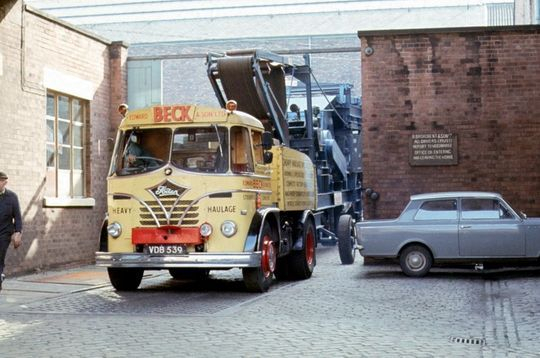 Seen here when brand new parked outside the offices of Foden at Sandbach in 1959 is Foden S20 ballast tractor Reg No ODB 832. 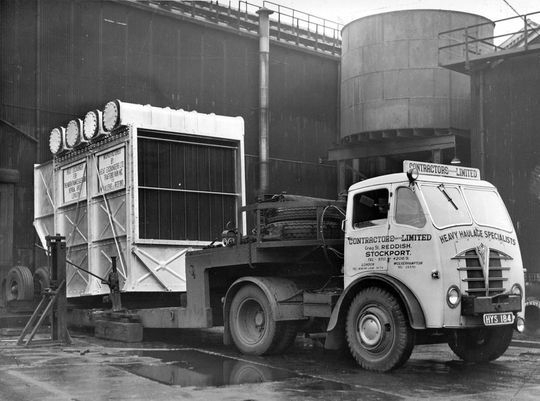 "It was really not a success and a far cry from the reliability of the Gardner engined Foden's we had in our fleet at that time". A nice colour shot of Foden S20 Reg No ODB 832, this time minus its ballast box and being utilised as a tractor unit. 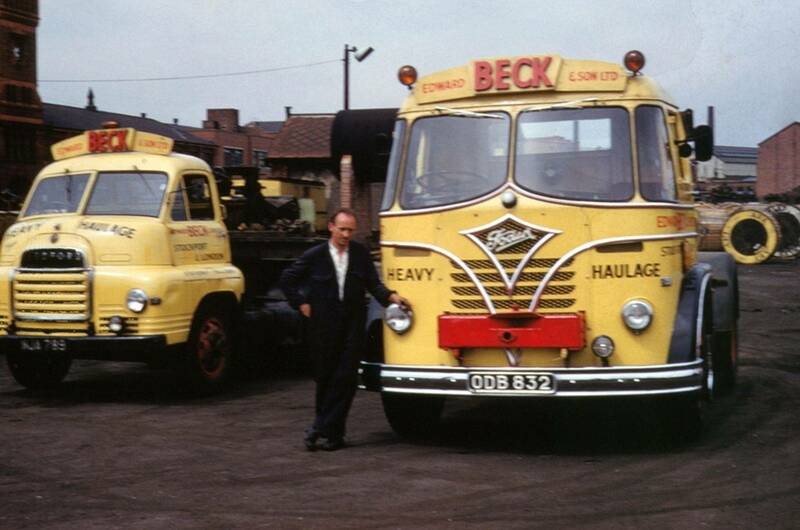 It is pictured in the depot at Greg Street in 1960 alongside one of Beck's S-Type Bedford 4x2 tractor unit's Reg No MJA 789. Again seen here being utilised as a tractor unit is Foden S20 Reg No ODB 832. 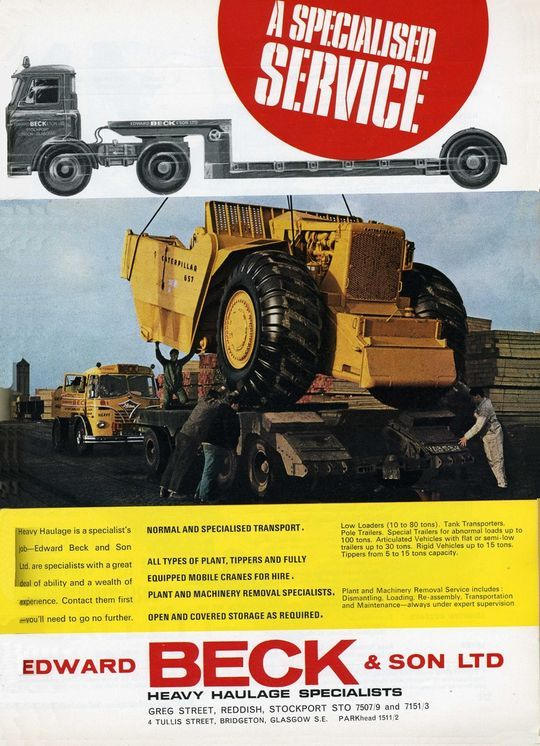 Powered by a Foden FD6 2-stroke engine it is pictured in the depot at Greg Street after unloading a Coles-Thornycroft Amazon 7 ton mobile crane from the rear of a four in line low-loader. 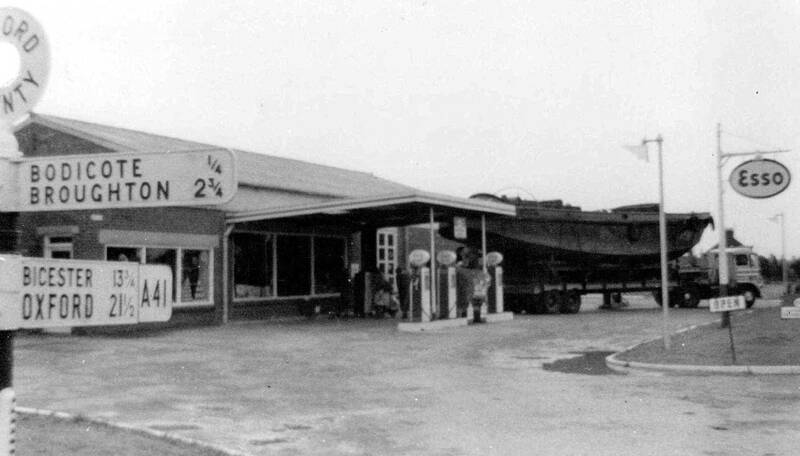 In this great period shot Foden S20 Reg No ODB 832 stops off for fuel at an Esso station on the old A41 in Oxfordshire en-route to Southampton. It is hauling a step frame tandem axle trailer loaded with a barge which had been collected from Birkenhead. 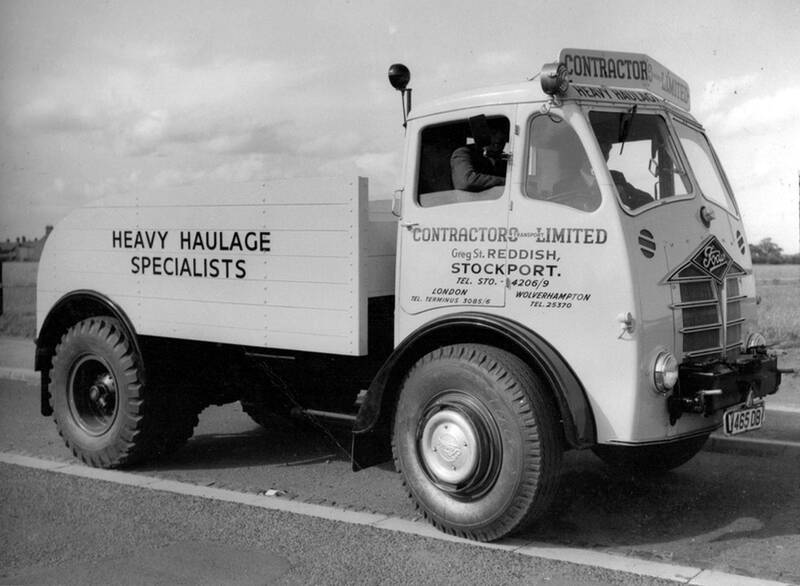 Originally new to Pickford's in 1950, FG Foden 6x4 heavy duty tractor unit Reg No HGB 631 is seen here on the A57 Hyde Road near Denton in October 1959. Louis Riley, Edward Beck's sales manager, takes time out for a photograph at Greg Street depot in 1961 with FG Foden 4X2 tractor unit Reg No KDB 703. Registered new in 1961 Foden S20 4x2 heavy duty ballast tractor Reg No VDB 539 was driven by Stan Ardern. 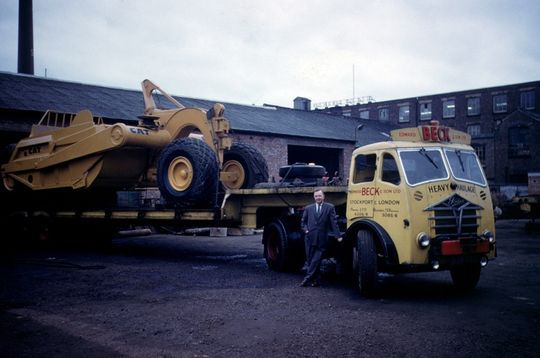 It is pictured here at the premises of Robert Broadbent & Son Ltd., Phoenix Ironworks, Stalybridge while collecting an industrial stone crusher. 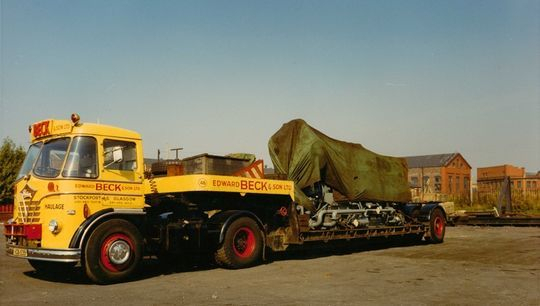 With driver Stan Ardern at the wheel Foden S20 4x2 heavy duty ballast tractor Reg No VDB 539 prepares to leave the premises of Robert Broadbent & Son Ltd Phoenix Ironworks Stalybridge after collecting an industrial stone crusher. 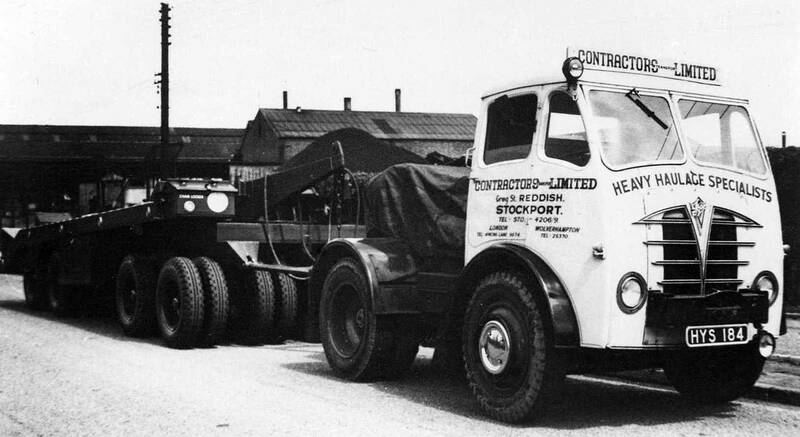 Another shot shows driver Stan Ardern at the wheel as he pulls out of the premises of Robert Broadbent & Son Ltd in Stalybridge in Foden S20 4x2 heavy duty ballast tractor Reg No VDB 539 after collecting an industrial stone crusher. Foden S20 4x2 heavy duty ballast tractor Reg No VDB 539, driven by Stan Ardern, is seen here in 1962 leaving Bowmakers Plant Ltd in Cannock with a Caterpillar bulldozer on board. 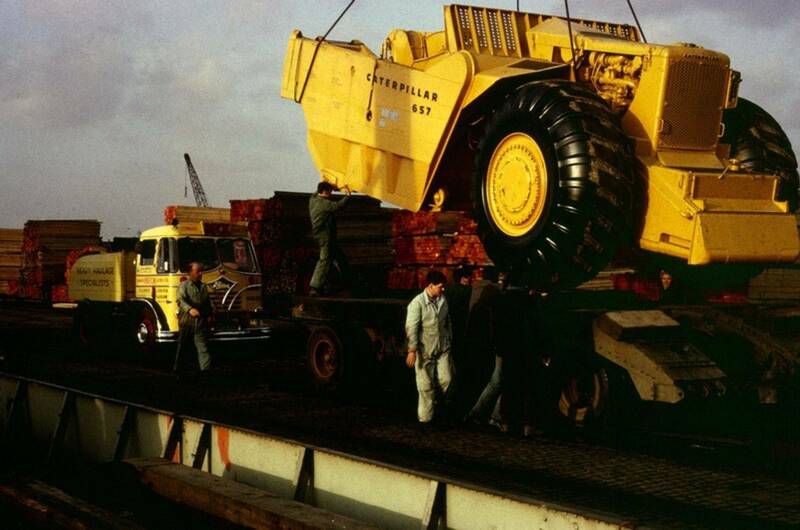 Foden S20 4x2 heavy duty ballast tractor Reg No VDB 539, driven by Stan Ardern, is seen here on shunting duties at Salford Docks in 1967 during the loading of a Caterpillar 657 Scraper imported from the USA. With the obligatory car parked in the way, Foden S20 heavy duty ballast tractor Reg No VDB 539 pulls out of Greg Street depot with a large drum of electric cable. 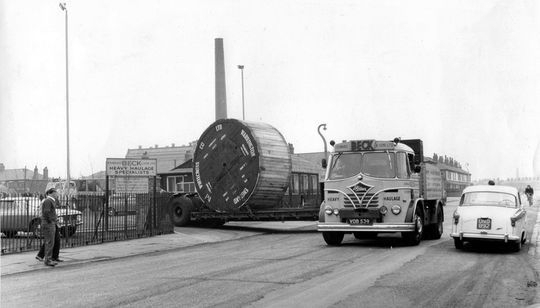 The single drum contained 4513 metres of electric cable which weighed almost 37 tons. Another shot of Foden S20 4x2 heavy duty ballast tractor Reg No VDB 539 again pictured at Salford Docks while hauling a low-loader loaded with a brand new Caterpillar 657 Scraper imported from the U.S.A.
Foden S20 4x2 heavy duty ballast tractor Reg No VDB 539, driven by Stan Ardern, is pictured here in 1968 hauling a motorway bridge section destined for the M62 Rakewood Viaduct. Foden S20 4X2 tractor unit Reg No VDB 539 is seen here being utilised as a tractor unit. 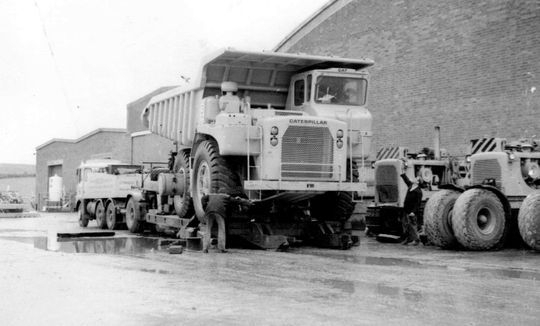 This vehicle also doubled up as a ballast tractor with a removable ballast box as can be seen in the two previous pictures above. 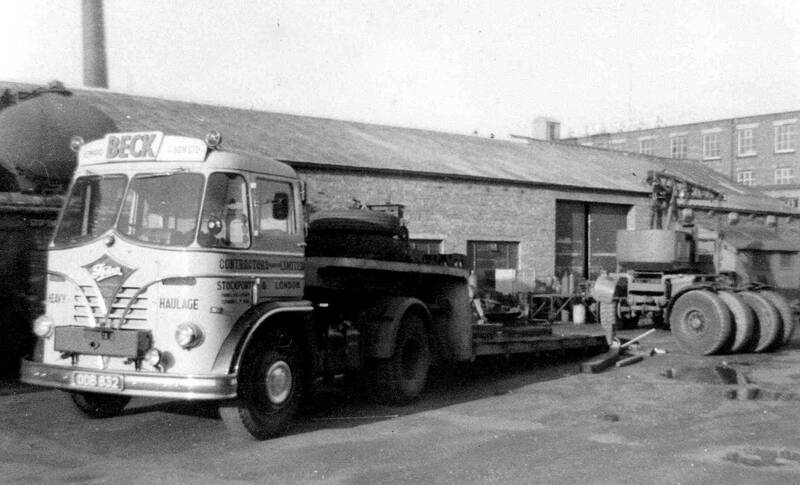 Parked in the depot at Greg Street in 1969, it is coupled up to a four-in-line low-loader loaded with a large marine engine. Nicknamed 'The Big Bopper' S20 Foden heavy haulage 6x4 ballast tractor Reg No ODB 793, powered by a Rolls Royce engine, makes its way through the streets of Ardwick Green Manchester in 1964. It is hauling a long steel vessel that had been manufactured by Daniel Adamson and Co of Dukinfield. Pictured here parked in the depot at Stockport when brand new in 1970 is Foden S40 6x4 ballast tractor Reg No OJA 859H which was named 'Sue' after Teddy Beck's youngest daughter. The 75 ton outfit, powered by a Cummins engine, was used regularly for transporting Caterpillar construction equipment around the UK from Salford Docks and also from Caterpillars factory at Cannock. Driven from new by Jack Bradshaw, with Steve Phillips as steersman/mate, this was the last brand new ballast tractor to enter service with the company before Edward Beck & Son Ltd ceased trading two years later in 1972. After Edward Beck closed Jack Bradshaw went on to drive for Kay Goodfellow's while Steve Phillips joined him later as steersman. 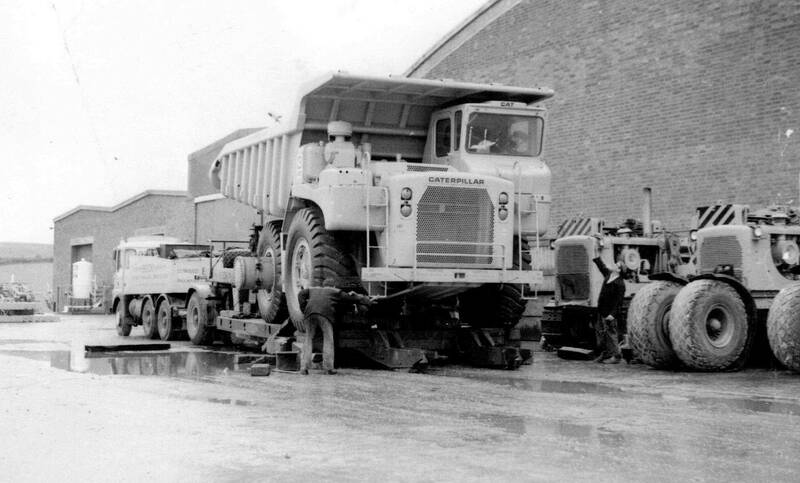 Foden S40 6x4 ballast tractor Reg No OJA 859H is pictured here at Bowmaker Plant Ltd Cannock during the off loading of a Caterpillar dump trunk which had previously been collected from Salford Docks. 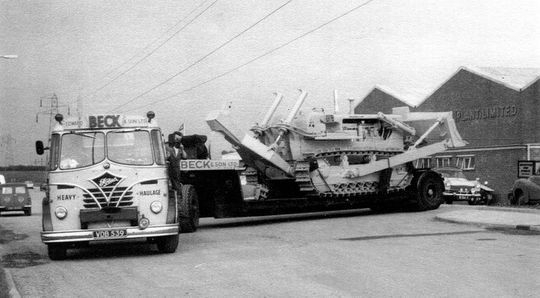 Another shot at taken at Bowmaker Plant Ltd Cannock shows Foden S40 6x4 ballast tractor Reg No OJA 859H during the off loading of a Caterpillar dump trunk which had been collected from Salford Docks. 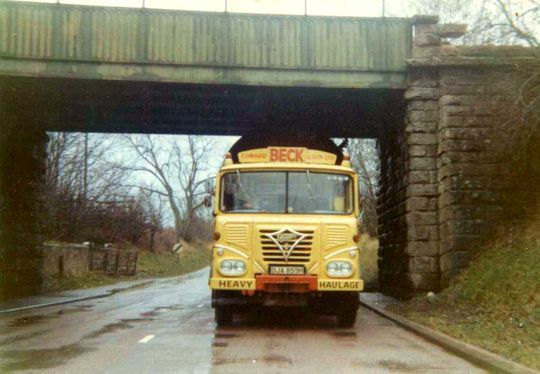 Foden S40 6x4 ballast tractor Reg No OJA 859H 'Sue' is seen here parked up on the M6 Keele Service area in Staffordshire with driver Jack Bradshaw at the wheel and drivers mate Steve Phillips in the passenger seat. 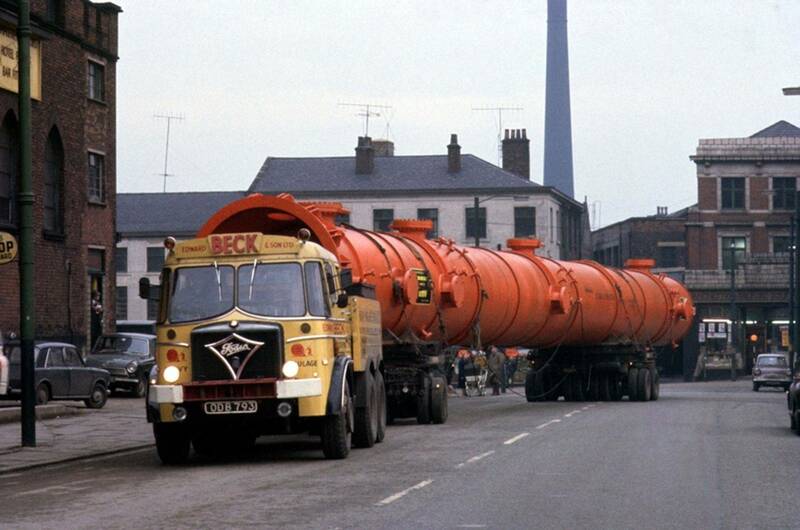 March 1971 and Foden S40 6x4 ballast tractor Reg No OJA 859H 'Sue', driven by Jack Bradshaw, is pictured here en-route during the delivery of a large steel vessel to a whisky distillery in Edinburgh. 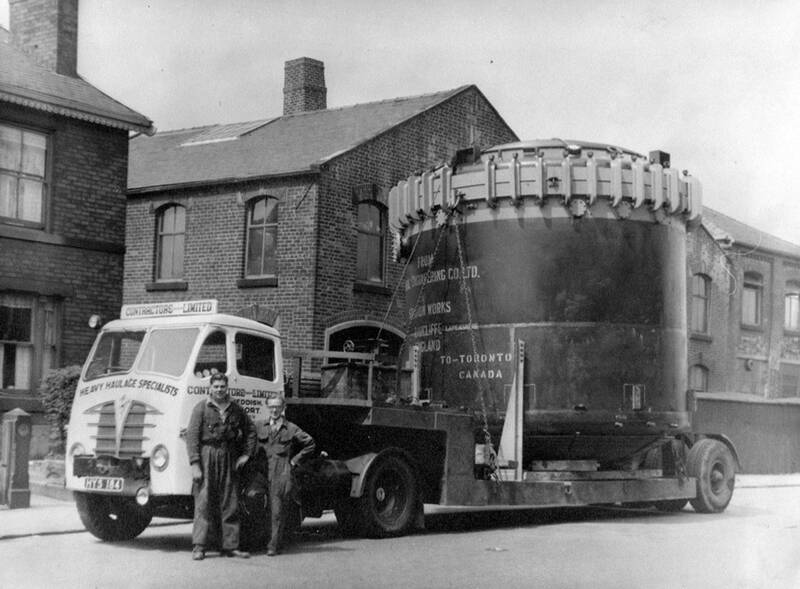 "We collected the load from Dudley in the West Midlands and set off on the journey to Edinburgh, a distance of 290 miles. 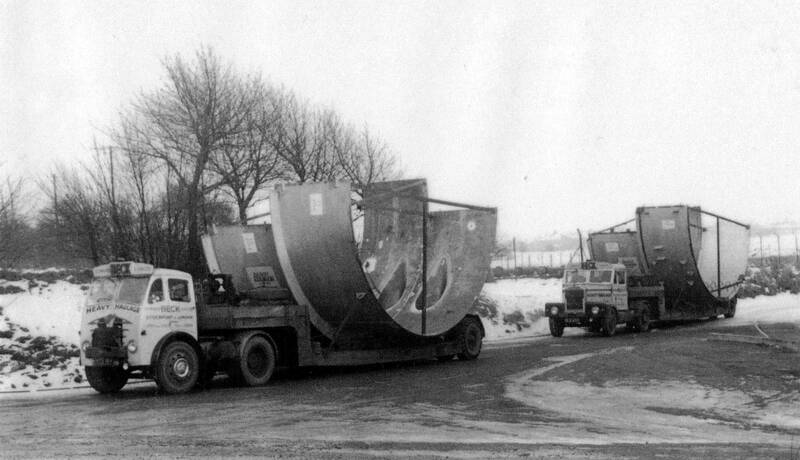 During the planning of the route the low bridge in the picture above was due to be demolished the week previous before the movement of the load. On arrival at the bridge the demolition had for some reason been delayed resulting in us having to lower the suspension to get the load to pass beneath it with just inches to spare". 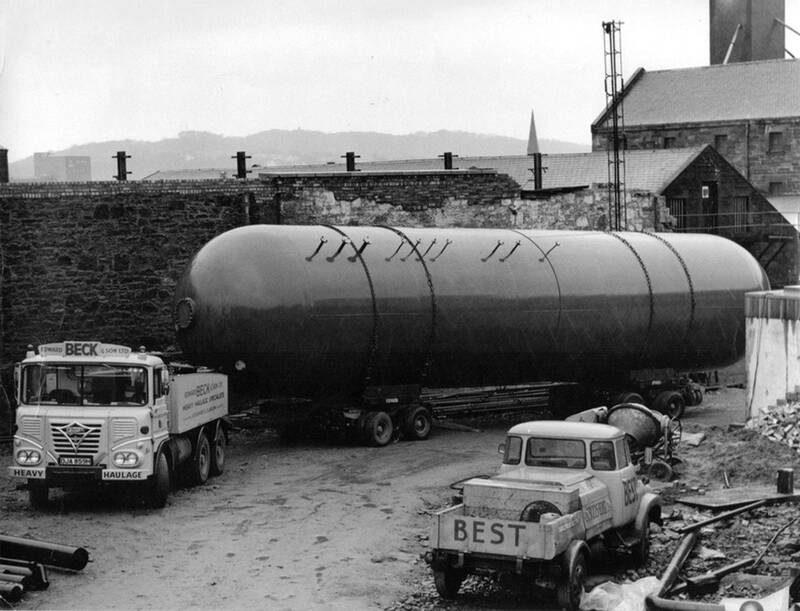 Foden S40 6x4 ballast tractor Reg No OJA 859H 'Sue' is pictured here in March 1971 after delivering this large steel vessel to a whisky distillery in the centre of Edinburgh. The load had been previously collected from Dudley in the West Midlands a distance of 290 miles. Click on any of these pictures to view full size. 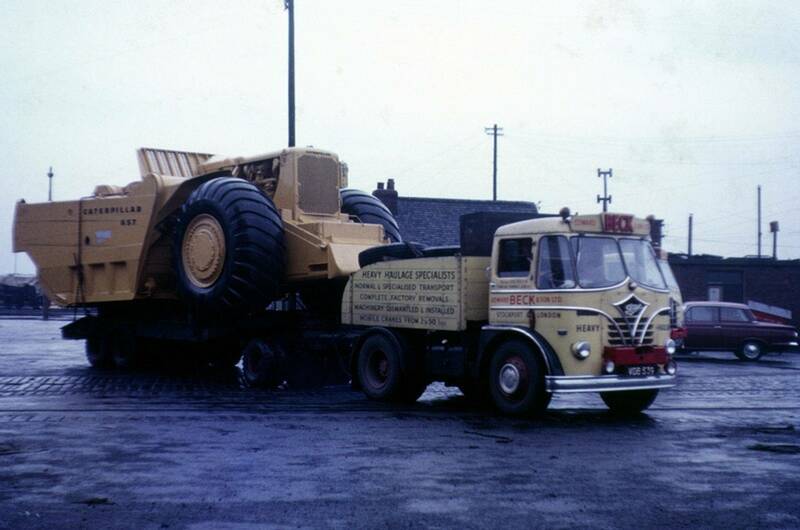 Another shot taken in Edinburgh in March 1971 shows Foden S40 6x4 ballast tractor Reg No OJA 859H shortly after arriving on site following the long journey from Dudley in the West Midlands. This final shot of Foden S40 6x4 ballast tractor Reg No OJA 859H shows it parked on the fuel island at the M6 Northbound Keele service area in Staffordshire. At the time it would be returning empty to Salford Docks after delivering Catterpillar plant equipment to Bowmaker Plant Ltd at Cannock Stafforshire.